It’s a hackneyed idea we all too often fall for: that marriage means being whisked away into the sunset, whispering sweet nothings into each other’s ears, and looking enchanting forever and ever and ever. It’s why we women can’t help but squeal with delight when the diamond ring slips into our finger, a symbol that the sparkle, the glisten, and the romance will last for all eternity. It’s easy to blame the Internet age. Social media makes us believe that everything, even our relationships, have to look perfect; have to be interesting enough for people to like, share, and comment on. But, as women, it’s harder to look into our own expectations. For some reason, we’ve always thought that we must be romanticized, chased after, showered with surprises, love poems and amazing gifts. While that is true to some extent, in marriage, we shouldn’t expect that kind of proof anymore because truth be told, it’s found elsewhere. In something far deeper, in an act more sacred, in a word more beholding: service. When the excitement of the wedding and the novelty of married life wears off, the rhythms of daily life settle in. The challenges come; the tests are handed over, one after another. This is where the couple learns — the hardest but surest way — that the solution is not in dining out, buying gifts, and taking road trips, just as we did when dating was the name of the game. The secret is this: for the sparkle and shine of the marriage to last for all eternity, it needs ceaseless polishing and hard work. The husband must learn how to toil and to earn; how to do the errands for his pregnant wife; how to take out the trash and clean the toilet. The wife must learn how to do the groceries; how to welcome her husband home after a long day at the office; how to craft the house into an abode. Both must learn how to forgive when wronged, be extremely patient, and get down on their knees as an act of pure humility. Anyone can do romance. It takes two people who are faithfully and wholly in love to do service — real, raw, rhythmic service. We women ought to be told that when a husband chooses to do the grocery for you when you are sick, goes to every single OB/GYN appointment, volunteers to wash the stack of dishes for the night, forgives you for the same mistakes, and embraces your quirks and all, he is still madly in love with you. Even though there are less flowers and shorter text messages, less candlelit dinners and smaller gifts, it’s more than okay. Because the love is in the sacrifice, in the every day. And we women ought to be reminded that we, too, must do the same for our husbands. That we must also get down on our knees, die to romantic expectations, and truly love our husbands amidst the hustle and bustle of daily life. After all, ‘the wife of noble character is worth far more than rubies.’ Noble, not romantic, is what we must strive to be. 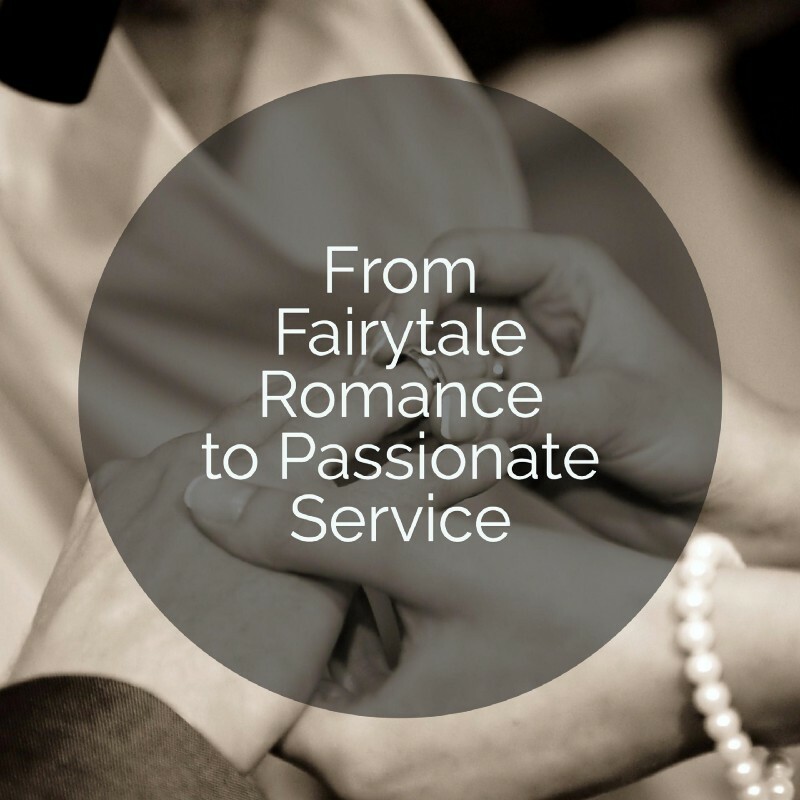 The best thing we can do for our marriages is to embrace service, with a joyful heart, with an unconditional love. Service is the singular thread that weaves together the fabrics of the everyday mundane and transforms them into a tapestry of a love well lived. Isn’t that the masterpiece we deserve? Isn’t that the marriage we all want? Is there anything greater? ‘Greater love has no one than this: to lay down one’s life for one’s friends.’ In this case, for our spouses, the love of our lives. Is there anything greater? I say none.